Fresh beef adulterated with sulphur dioxide was found in a Hong Kong market by the Centre of Food Safety. The adulteration of fresh or chilled meat with sulphur dioxide carries hefty penalties of fines and even prison time. Sulphur dioxide is a widely used preservative and antioxidant for foods and beverages that include dried fruits, processed meat products such as sausages, soft drinks and alcoholic beverages. The substance is harmless to healthy persons, however, in subjects with a sulphur dioxide allergy, breathing difficulties and asthma can be induced. I attended the Safe Food California Conference last week in Monterey, California. Food fraud was not the main focus of the conference, but there was some good food fraud-related content. Craig Wilson gave a plenary session about the past, present and future of food safety at Costco. As part of that presentation, he discussed their supplier ingredient program. This program was implemented in response to the 2008 Salmonella Typhimurium outbreak in peanut paste but has direct applicability to food fraud prevention. Food Fraud: Problem Solved? 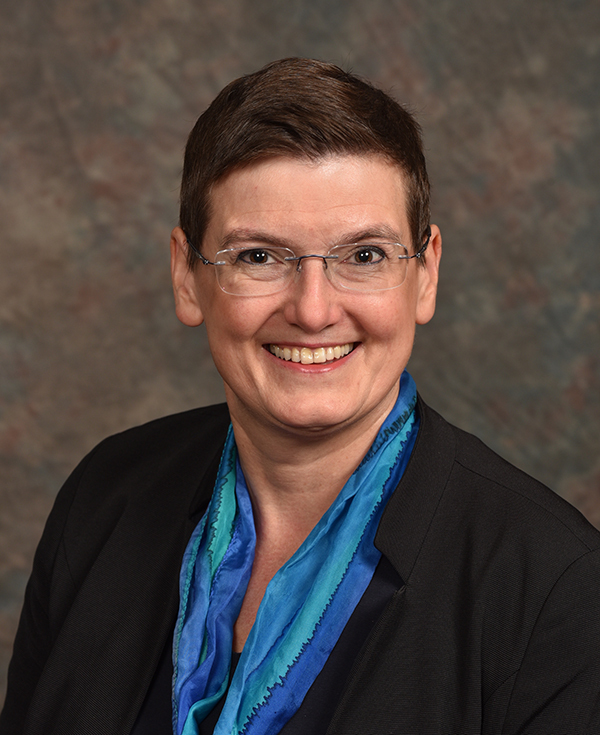 Learn more at the 2019 Food Safety Supply Chain Conference | May 29–30, 2019 | Attend in Rockville, MD or virtually Jeanette Litschewski from SQFI gave a breakout presentation on the most common SQF non-conformities in 2018. 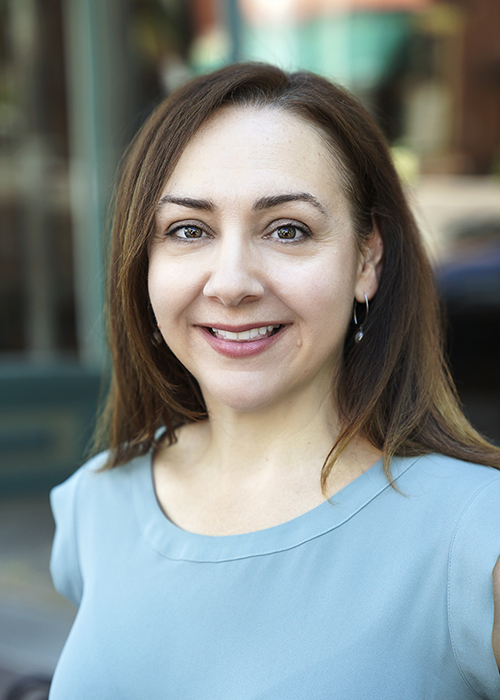 She presented data from 7,710 closed audits that cited 44,439 non-conformities. Of those, 756 were related to food fraud requirements. While this presentation was not focused on the specifics of the food fraud non-conformities, Jeanette did mention that many of them were related to broad issues such as not having completed a food fraud vulnerability assessment or appropriately documenting that each of the required factors was addressed in an assessment. I was invited to give a breakout presentation with an overview of food fraud issues globally and a brief outline of some of the tools currently available to assist with conducting vulnerability assessments. Although many of the attendees had already began implementation of food fraud measures, there was a lot of interest in this list of tools and resources. Therefore, I am recreating the list in Table I. The focus is on resources that are either complimentary or affordable for small- and medium-sized businesses, with recognition that “full-service” and tailored consulting services are always an option. The USP Food Fraud Mitigation Guidance referenced in Table I is a great source of general information on food fraud mitigation, as is the “Food Fraud Prevention” document created by Nestle. Many of the GFSI Certification Programme Owners have also released guidance documents about vulnerability assessments, such as BRC, FSSC 22000, and SQF. 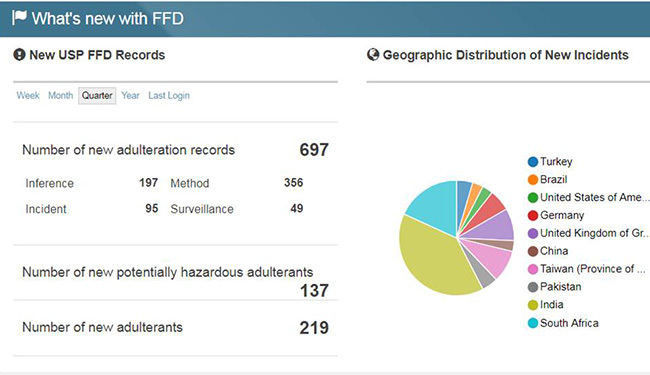 The Decernis Food Fraud Database and the FPDI Food Adulteration Incidents Registry (see Table I) are two sources of historical food fraud data that are referenced specifically in the SSAFE/PwC tool. Companies can also track official information about food safety recalls and alerts (including related to food fraud) from public sources such as the FDA Recalls, Market Withdrawals, & Safety Alerts; Import Refusals; Warning Letters; USDA Recalls and Public Health Alerts; EU RASFF, and many others. Of course, there are quite a few companies that offer tailored tools, training and consulting services. 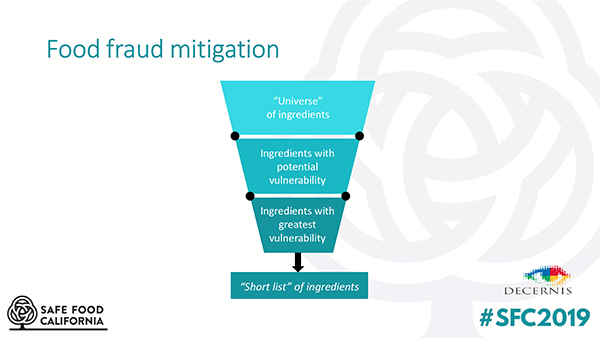 Companies that offer courses in food fraud mitigation and assistance in creating a vulnerability assessment (or FDA-required food safety plan) include NSF, Eurofins, AIB International, SGS, and The Acheson Group. Also available are services that compile food safety recalls and alerts (including those resulting from food fraud) from multiple official sources, such as FoodAKAI and HorizonScan. EMAlert is a proprietary tool that merges public information with user judgment to inform food fraud vulnerability. Horizon Scanning is a system that can monitor emerging issues, including food fraud, globally. Vulnerability assessments should help focus resources towards those ingredients truly at risk of fraudulent adulteration. In short, there are many resources available to help support your food fraud vulnerability assessments and mitigation plans. If I have unintentionally missed mentioning any resources you have found to be helpful, please let us know in the comments. Why Include Food Fraud Records in Your Hazard Analysis? Food fraud is a recognized threat to the quality of food ingredients and finished food products. There are also instances where food fraud presents a safety risk to consumers, such as when perpetrators add hazardous substances to foods (e.g., melamine in milk, industrial dyes in spices, known allergens, etc.). According to the FDA draft guidance, chemical hazards can include undeclared allergens, drug residues, heavy metals, industrial chemicals, mycotoxins/natural toxins, pesticides, unapproved colors and additives, and radiological hazards. USP develops tools and resources that help ensure the quality and authenticity of food ingredients and, by extension, manufactured food products. More importantly, however, these same resources can help ensure the safety of food products by reducing the risk of fraudulent adulteration with hazardous substances. 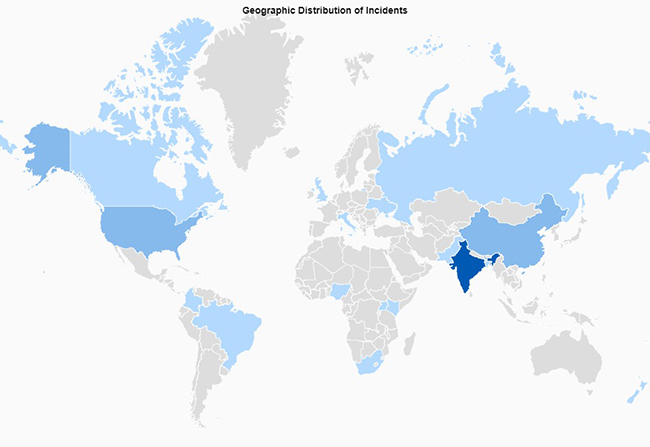 Geographic Distribution of Incidents for Dairy Ingredients. Graphic courtesy of USP. Data from food fraud records from sources such as USP’s Food Fraud Database (USP FFD) contain important information related to potential chemical hazards and should be incorporated into manufacturers’ hazard analyses. USP FFD currently has data directly related to the identification of six of the chemical hazards identified by FDA: Undeclared allergens, drug residues, heavy metals, industrial chemicals, pesticides, and unapproved colors and additives. The following are some examples of information found in food fraud records for these chemical hazards. Undeclared allergens: In addition to the widely publicized incident of peanuts in cumin, peanut products can be fraudulently added to a variety of food ingredients, including ground hazelnuts, olive oils, ground almonds, and milk powder. There have also been reports of the presence of cow’s milk protein in coconut-based beverages. Drug residues: Seafood and honey have repeatedly been fraudulently adulterated with antibiotics that are not permitted for use in foods. Recently, beef pet food adulterated with pentobarbital was recalled in the United States. 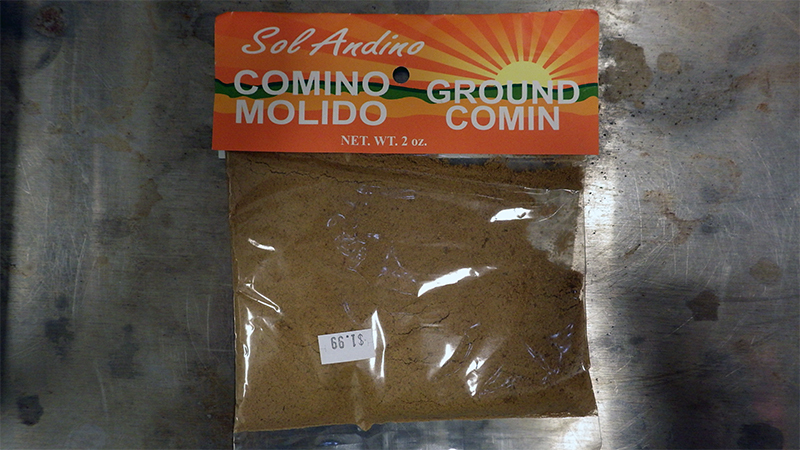 Heavy metals: Lead, often in the form of lead chromate or lead oxide which add color to spices, is a persistent problem in the industry, particularly with turmeric. Industrial Chemicals: Industrial dyes have been associated with a variety of food products, including palm oil, chili powder, curry sauce, and soft drinks. Melamine was added to both milk and wheat gluten to fraudulently increase the apparent protein content and industrial grade soybean oil sold as food-grade oil caused the deaths of thousands of turkeys. Pesticides: Fraud in organic labeling has been in the news recently. Also concerning is the detection of illegal pesticides in foods such as oregano due to fraudulent substitution with myrtle or olive leaves. Unapproved colors/additives: Examples include undeclared sulfites in unrefined cane sugar and ginger, food dyes in wine, and tartrazine (Yellow No. 5) in tea powder. Because of its high nutritional value and distinctive flavor, natural honey is a premium product with a price tag significantly higher than that of other sweeteners. As a result, honey is often the target of adulteration using low-cost invert sugar syrups. 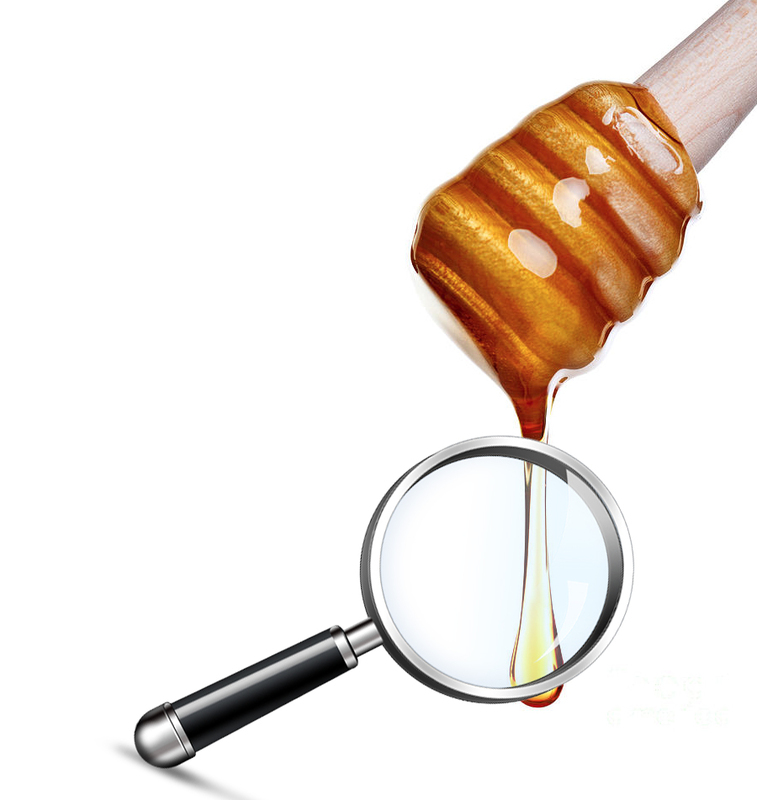 This article looks at two analytical approaches based on isotope fingerprint analysis using isotope ratio mass spectrometry (IRMS) that can be used to detect honey adulteration and safeguard product integrity. Fructose and glucose are the major components of honey, and account for 85–95% of the total sugars present. The remaining carbohydrates are a mixture of disaccharides, trisaccharides, and larger oligosaccharides, which give individual honeys their own characteristic taste. These distinctive flavors, combined with honey’s renowned nutritional benefits and a growing consumer demand for natural, healthy ingredients, have contributed to a substantial increase in honey sales over the past few decades. However, this demand has also helped to raise costs, with some varieties, such as Manuka honey, reportedly selling for as much as $35 for a 250 gm jar. Just like many other food products that have a premium price tag, intentional adulteration is a significant concern for the honey industry. The fraudulent addition of cheaper sweeteners, such as sugar derived from cane, corn and beet sources, to extend product sales, is unfortunately common within the marketplace. 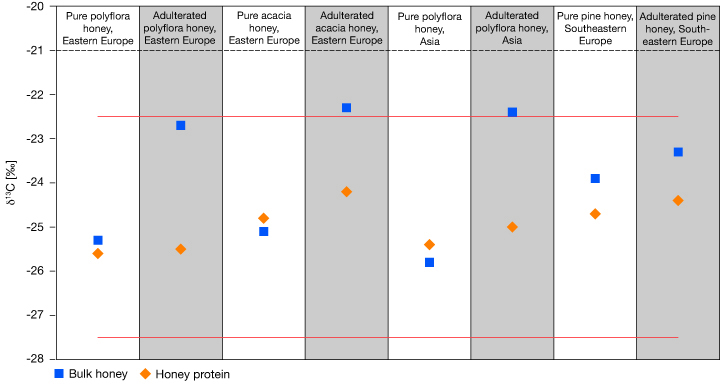 Honey producers and suppliers therefore require reliable and accurate analytical techniques to profile the composition of honey to identify cases of adulteration. Using analytical data, honey adulteration and counterfeiting can be routinely identified and product integrity can be maintained. Analysis of honey is commonly undertaken using isotope ratio mass spectrometry (IRMS) for the detection of adulteration. Honey has a fingerprint, a unique chemical signature that allows it to be identified. To visualize this fingerprint, IRMS can be used to identify the botanical origin of its constituent sugars. Two ways that carbon can be incorporated into plants by photosynthetic CO2 fixation are the Calvin cycle (also known as the C3 cycle) and Hatch-Slack cycle (the C4 cycle). The nectar used by bees to produce honey comes from plants that produce sugars via the C3 pathway, while the sugars derived from sugar cane and corn are produced by the C4 pathway. Carbon naturally exists as two stable isotopes that behave in the same way, but possess different atomic mass numbers. Carbon-12 is the most abundant in nature (98.9%), whereas carbon-13 is far less common (1.1%). By measuring the ratio of carbon-13 to carbon-12 (13C/12C) using IRMS, the carbon isotope fingerprint of the honey can be determined. As more carbon-13 is incorporated in sugars produced by the C4 pathway, the adulteration of honey with sugar cane and fructose corn syrups, rich in C4 sugars, can be detected. In unadulterated honey, the carbon isotope fingerprint will be similar to that of the natural protein precipitated from the honey. However, if cane sugar or high fructose corn syrup has been added, the isotope fingerprint of honey and protein will be significantly different. While EA-IRMS can be used to identify cases of honey adulteration using the bulk sample, the analysis of low levels of added C4 sugars and C3 sugars (i.e., beet sugars) to honey reveal that a compound specific technique with more powerful separation capabilities is needed. Furthermore, as fraudsters develop more sophisticated adulteration techniques and effective ways of concealing their actions, it can be necessary to utilize other IRMS techniques. Much lower limits of adulteration detection can be obtained from liquid chromatography interfaced with IRMS (LC-IRMS). This technique permits the analysis of very small sample amounts without the need for extensive preparation or derivatization, and can also identify C3 sugar adulteration, which EA-IRMS cannot readily achieve, and therefore serves as a strong, complimentary isotope fingerprint technique. There are IRMS portfolios available that allow for sequential automated analysis of both analytical techniques. Using LC-IRMS, the sample is oxidized within the aqueous solvent eluting from the HPLC column. The oxidation reagent consists of two solutions: The oxidizing agent itself and phosphoric acid. Both are pumped separately and added to the mobile phase. Within this mixture, all individual organic compounds eluting from the HPLC column are oxidized quantitatively into CO2 upon passing through a heated reactor. In a downstream separation unit, the generated CO2 is then separated from the liquid phase and carried by a stream of helium gas. The individual CO2 peaks in the helium are subsequently dried in an on-line gas drying unit and admitted to the isotope ratio mass spectrometer via an open split interface. In the following article, the author reports finding Sudan dye in spices in New York State, making the argument for Class I recalls. In New York State (NYS), Department of Agriculture and Markets food inspectors routinely sample domestic and imported food from retail markets for food dye determination. For decades, the NYS Food Lab has examined both domestic and imported food for undeclared allowed food dyes and unallowed food dyes utilizing a paper chromatography method. This method works well with water-soluble acid dyes, of which food dyes are a subset. The NYS Food Lab has participated in four sets of the FAPAS proficiency tests: Artificial Colours in Soft Drinks and Artificial Colours in Sugar Confectionary (Boiled Sweets). The qualitative analysis was by paper, thin layer silica and thin layer cellulose chromatography. Satisfactory results were obtained. The paper/thin layer chromatography method is a qualitative non-targeted method and has a limit of detection of approximately 1 to 5 ppm (parts per million) depending on the dye. If an unallowed dye is detected, the food product is violated as adulterated and results are forwarded to the FDA. Early 2011, sesame seeds were found to contain Rhodamine B. 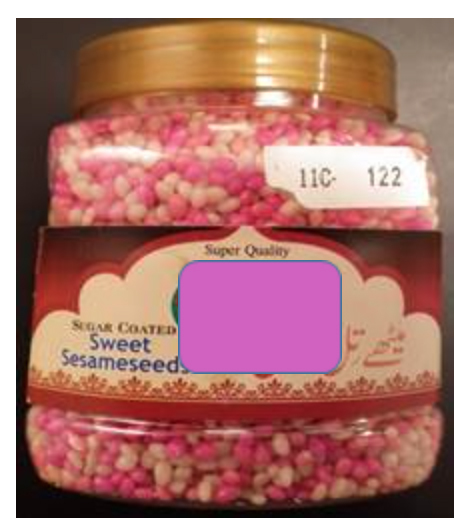 In early 2011, a food sample of pink colored sugar coated sesame seed from Pakistan was sent to the lab for color determination. The paper chromatography method could not determine any dyes. (As found out later, the unknown pink dye was not an acid dye.) From research it was found that Rhodamine B was a pink water soluble basic dye commonly used as a food adulterant. A standard was ordered and then a qualitative high performance Liquid chromatography-tandem mass spectrometry (HPLC/MS/MS) method was developed (Waters UPLC Aquity w/Waters Premier XE triple quadrapole) to determine Rhodamine B. After utilizing this new method, Rhodamine B was found in the sugar coated sesame seed. Rhodamine B is an industrial dye and is not allowed in food anywhere in the world. Industrial dyes are not allowed in food because they are toxic; in fact, some industrial dyes are used for suicide.2,3,4 In addition, industrial dyes are not made to “food grade” specifications with regard to dye purity, heavy metal (i.e., arsenic and lead) concentrations, subsidiary dye concentrations and concentrations of unreacted precursors. From additional research of news articles and research papers, more industrial dyes were identified as common food adulterants; more dye standards were ordered and incorporated into the HPLC/MS/MS method. The NYS Food Lab’s current HPLC/MS/MS surveillance method includes 36 compounds: Water soluble “acid dyes” and “basic dyes”, organic solvent soluble “solvent dyes”, and several pigments. The HPLC/MS/MS method has a limit of detection in the ppb (parts per billion) range for some dyes and parts per trillion for other dyes. The FDA has an action level of 1 ppb for certain water-soluble basic dyes (such as Malachite Green) when used as a fish antibiotic. However, due to concern that unallowed dyes might be present due to contamination from packaging, the food lab subsequently set an action level of 1 ppm for unallowed dyes determined by the HPLC/MS/MS method. At levels over 1 ppm, detection of dyes in food would indicate intentional dye usage for coloring food. The food lab has participated in three rounds of the FAPAS proficiency test, “Illegal Dyes found in Hot Pepper Sauce”. The qualitative analysis was by LC/MS/MS. Satisfactory results were obtained. Sudan Dyes are a family of more than 10 synthetic industrial “solvent dyes”. Solvent dyes are typically used to color oils and waxes, including shoe polish. Sudan dyes that the food lab has found in spices include Sudan 1 (Sudan I), and Sudan 4 (Sudan IV). Sudan 1, also known as Solvent Yellow 14, is an orange colored dye. 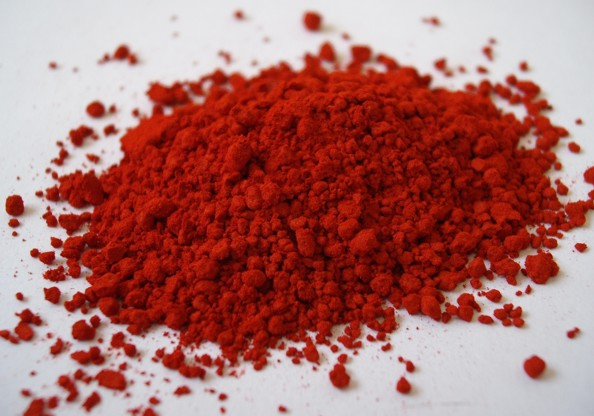 Sudan 4, also known as Solvent Red 24, is a blue shade red colored dye. Positive identification of Sudan 4 is often hindered by the existence of a positional isomer, Sudan Red B (Solvent Red 25). This problem was addressed by using the HPLC/MS/MS method with a transition unique to Sudan 4 (381.2 > 276.0). This information was obtained from one of the two corroborating labs. The food lab has recently identified a transition unique to Sudan Red B (381.2 > 366.1). In March 2001, Europe began discovering Sudan dyes in spices. A February 2017 search of Europe’s Rapid Alert System for Food and Feed (RASFF) for “unauthorised colour” and “sudan” in the “herbs and spices” food category resulted in 429 notifications. 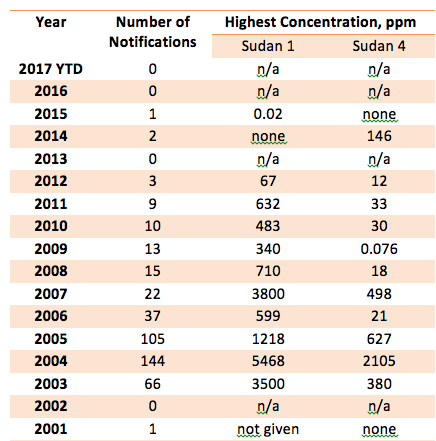 The 429 RASFF notifications arranged by year and by maximum concentration reported of Sudan 1 and Sudan 4 during that year are listed in Table I. In a search of the FDA’s Import Alert 45-02 (Detention Without Physical Examination and Guidance of Foods Containing Illegal and/or Undeclared Colors) the author could find no record of spices violated for Sudan dye adulteration. In a search of the FDA’s Enforcement Reports the author could find no record of spices violated for Sudan dye adulteration. Industrial Dyes in Food: Class II or Class I Recall? The NYS Food Lab and the FDA routinely find imported food containing unallowed food dyes such as Ponceau 4R, Amaranth and Carmoisine. These unallowed food dyes are allowed for use in food in other parts of the world, while not allowed in the USA. Foods containing unallowed food dyes are violated as adulterated and a Class II recall will occur. Sudan dyes are not allowed as food dyes anywhere in the world. They are industrial dyes, used in coloring oils and waxes, such as shoe polish. “Class I recall: A situation in which there is a reasonable probability that the use of or exposure to a violative product will cause serious adverse health consequences or death. With a Class II recall, there is no consumer notification. In contrast, as part of a Class I recall, a press release is issued. Consumers who have purchased the product might be informed and may discard the product or return it for a refund. 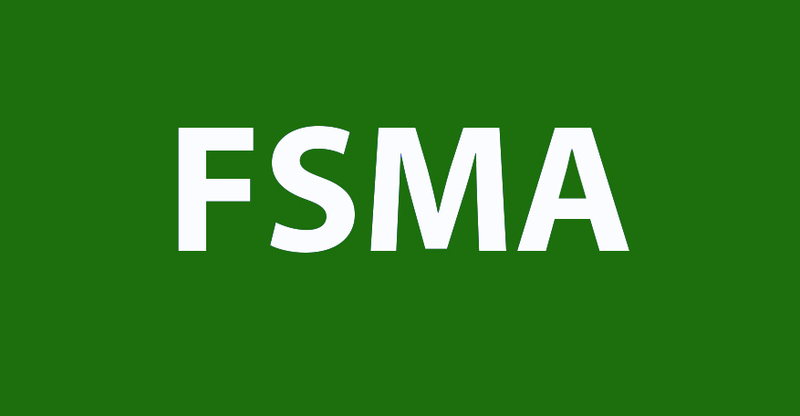 FDA just released the final FSMA rule, “Mitigation Strategies to Protect Food Against Intentional Adulteration”. Under the rule, domestic and foreign food facilities must complete and maintain a written food defense plan that assesses their vulnerabilities to intentional contamination. The final rule will be published on the Federal Register tomorrow. To preview the PDF document, visit the Federal Register’s website. Yesterday FDA released its Reportable Food Registry (RFR) and cited Listeria monocytogenes as generating the greatest number of reports (223), along with undeclared milk (27), in Year Five (from September 8, 2013–September 7, 2014). 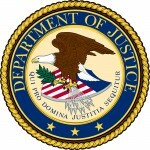 FDA defines a reportable food as “an article of food/feed for which there is a reasonable probability that the use of, or exposure to, such article of food will cause serious adverse health consequences or death to humans or animals.” The purpose of the registry is to allow FDA to track patterns of food and feed adulteration in order to help the agency focus its already limited inspection resources. Year Five saw 909 reportable food entries, including 201 primary reports regarding safety concerns with food or animal feed and 464 subsequent reports from suppliers or recipients of food or feed that was the subject of the primary reports, and 244 amended reports. The following food safety hazards were identified within the 201 primary reports in Year Five: Drug contamination, pathogenic E. coli, Listeria monocytogenes, nutrient imbalance, lead, Salmonella, undeclared allergens and undeclared sulfites. In addition, Salmonella, Listeria and undeclared allergens made up about 88% of the total primary entries for all five years of the RFR. 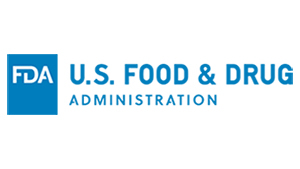 The report’s complete breakdown of the RFR submissions by year, along with identified commodities and hazards, is available on FDA’s website. This article was part of our April Fool’s special edition. While the information about the Interpol seizure is indeed factual, we made up the new detection method (EFAS). 35% of poll participants were correct in guessing that this was the article that contained false information. “Today’s rising food prices and the global nature of the food chain offer the opportunity for criminals to sell counterfeit and substandard food in a multi-billion criminal industry which can pose serious potential health risks to unsuspecting customers. 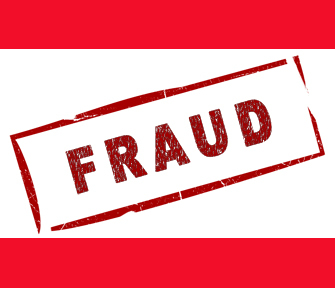 The complexity and scale of this fraud means cooperation needs to happen across borders with a multi-agency approach,” said Chris Vansteenkiste, cluster manager of the Intellectual Property Crime Team at Europol in an agency release. 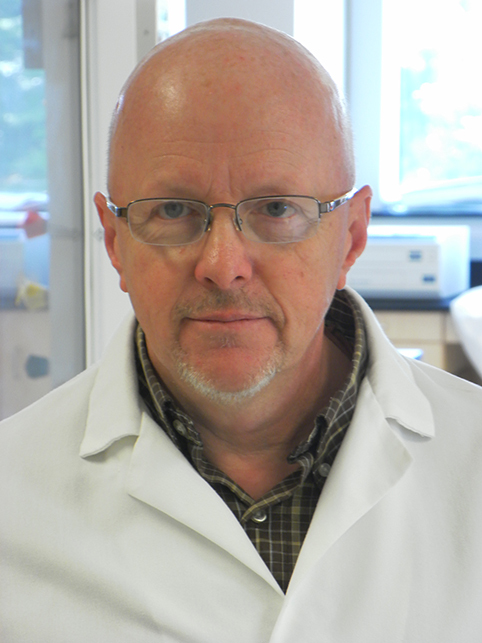 At a recent conference for food laboratory professionals, Gavin Rosenberg, Ph.D., discussed an emerging analytical method that could be game changing in detecting adulterated products in the field. 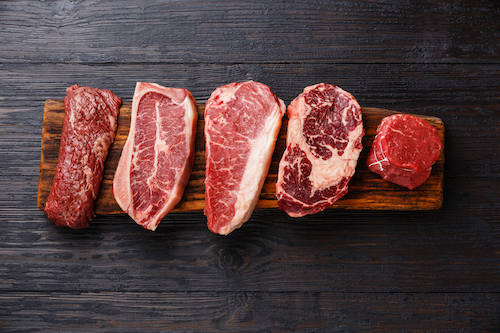 Using electrostatic fluorescence absorbance spectroscopy (EFAS), Rosenberg’s lab has been able to probe the chemical composition of products, from liquids to bulk and high-moisture foods, while simultaneously assessing concentration in products such as meat and even spices. The rapid and portable method is also highly sensitive and can provide trace detection of pathogens, dyes, antibiotics and pesticides within 60 seconds. “While still in the research stage, EFAS has been utilized in several studies and has successfully been shown to detect contaminants as well as ingredients that are frequently added to adulterate food products,” said Rosenberg. He indicated that his team will pursue initial applications of the product to identify adulteration of olive oil (nearly 70% of olive oil is adulterated or diluted) and ground beef, specifically in the European and Asian markets.